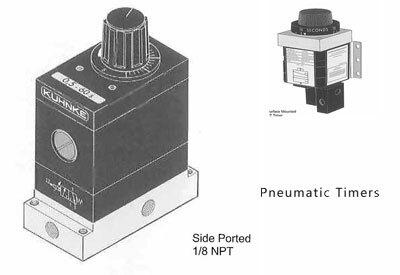 Operating a pneumatic timer is not difficult, as long as you know the basics of the specific model being used. The first step is to set the required time delay. The pneumatic timer will not start counting until an air supply is present (this is not the case for a specialist timer). Once the air supply is switched on, the timer will count until the reset signal is received. This will switch off the air supply. Simply put, these devices are logic devices. They are used to switch a main valve somewhere else in a circuit (the circuit that carries the signal for air supply). These timers can be operated with only inert gases, as long as the correct pressure is met. The biggest problem with pneumatic timers and inert gases is that gases escape into the atmosphere. There is always a consistent leak of these gases, so you will have to replace these gases. Using compressed air is a much more economical endeavor. There are places to use pneumatic timers that are more ideal than other places. The environment that timers operate in is very important. The devices work best in industrial automation and processing. Timers need to be shielded from extreme weather, and so that is why they are usually placed inside cabinets or on control panels. You also want to protect your timers from dust and other debris because the dust could mess with the performance of your device. It is important to note that most timers cannot directly operate a cylinder, and this is because timers are created as pilot devices. This means that they should only be added to larger control valve operations. There are certain timers that will allow users to directly operate small actuators. There are so many different timers to choose from, and it is important to purchase the correct devices. Buying the wrong timer can lead to lowered performance, which would decrease business. Speak to a professional about all your different options. Considering the risk of fire on an oilrig, it is important to take multiple steps to prevent any potential fires.